Depart from your hotel by 4×4 in early morning for the sheer rock walls of Todgha Gorge, along Lake Ouarzazate via the road of kasbahs. Pass through Skoura, a fertile oasis lined with immense palm groves, to reach the home of Morocco’s Rose Festival, El Kelâa M’Gouna (commonly referred to as the Valley of Roses). Continue through the Rose Valley and Ait Said, Tourbist, and Tamalout to reach the village of Bou-Thahrar. 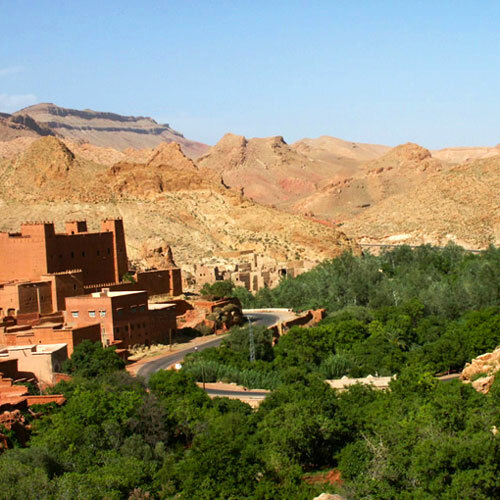 Enjoy a walking tour beside the River M’Goun, then continue by 4×4 to the Kasbah of Ait Youl Glaoui in the Dades Valley. Back to Boumalne toward Tinghir and walk through the impressive Todgha Gorge. Arrive at your hotel in Todra Gorge in the late afternoon for dinner and the night. After breakfast, hike the magnificent palm grove of Tinghir, which stretches 30 miles (48 km). Visit the traditional adobe architecture of the ancient Jewish quarter of Tinghir. Depart for Zagora via the village of Rissani, crossing the Tafilalet and vast mineral Massif Bougafer to reach Alnif. Lunch in Tazzarine or N’kob, as you desire. On to Tansikht through the Draa Valley oasis to Zagora. Arrive at your hotel in Zagora in the late afternoon. Dinner and night in Zagora. After lunch continue to the big dunes of Erg Chigaga. Arrive at the bivouac in time for a relaxing walk and sunset over the dunes. Traditional nomad dinner and night under the stars or in nomad tents.